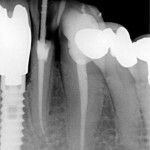 A number of different laser techniques have been considered as alternative approaches to traditional chemo- mechanical approaches for root canal disinfection. The aim of this review was evaluate the clinical efficacy of lasers as an adjunct to chemo-mechanical disinfection of root canals. The PubMed, Cochrane Controlled Trials Register (CENTRAL) and the ISI Web of Knowledge databases were searched together with references of identified studies. Three authors independently selected and assessed study quality. 5 studies were included only one of which was considered to be a randomised controlled trial. All 5 studies were considered to be of low quality, as no study reported a rationale for sample size: none presented a power analysis. reported blinding, during either the operative procedure or outcome analysis. All included publications were assessed to have low quality. This insufficient evidence does not necessarily imply that there is no positive effect of laser treatment as an adjunct to chemo-mechanical treatment of infected root canals or that laser treatment should not be used. But it does imply a need for high-quality studies because current knowledge of the efficacy of laser as an adjunct to chemo-mechanical disinfection of infected root canals is limited. Fransson H, Larsson KM, Wolf E. Efficacy of lasers as an adjunct to chemo-mechanical disinfection of infected root canals: a systematic review. Int Endod J. 2012 Oct 3. doi: 10.1111/iej.12003. [Epub ahead of print] PubMed PMID: 23095058.